Succulent Swiss chard, also known as spinach-chard or silverbeet, is one of the favorite green leafy vegetables of European origin. Botanically, it belongs to the beet family (Chenopodiaceae) of plants which also includes table-beets, sugar-beets, garden-beets, etc. garden-beets, etc. Scientific name: Beta vulgaris, Cicla group. Chard is seasonal leafy greens grown widely around the Mediterranean region. It is available at its best during summer months from June until November. Chard features distinctly large dark-green leaves with prominent petiole and well-developed edible stalk. In general, its leaves harvested at various stages of maturity depending on their use in recipes. While the whole plant with its tender young leaves can be harvested for salad preparation, mature, over-size leaves with slightly tough textured stem may be picked up for sautéing and cooking in dishes. Red stalk: Charlotte, Rhubarb Chard. Multi-color (variegated) stalk: Bright lights (white, orange, yellow, purple, pink). Swiss chard, like spinach, is the storehouse for many phytonutrients that have health promotional and disease prevention properties. Chard leaves are an excellent source of antioxidant vitamin, vitamin-C. Its fresh leaves provide about 33% of recommended levels per 100 g. As a powerful water-soluble antioxidant, vitamin-C helps remove free radicals and reactive oxygen species (ROS) from the human body through its reduction potential properties. Research studies suggest that regular consumption of foods rich in vitamin-C help maintain normal connective tissue, prevent iron deficiency, and also help the human body develop resistance against infectious agents by boosting immunity. Chard is one of the excellent vegetable sources for vitamin-K; 100 g provides about 700% of recommended intake. Vitamin-K has potential role bone health by promoting osteoblastic (bone formation and strengthening) activity. Adequate vitamin-K levels in the diet help limiting neuronal damage in the brain; thus, has an established role in the treatment of patients who have Alzheimer's disease. It is also a rich source of omega-3 fatty acids, and vitamin-A, flavonoids antioxidants like ß-carotene, alpha-carotene, lutein, and zeaxanthin. Carotenes convert into vitamin-A inside the human body. It is also plentiful in the B-complex group of vitamins such as folates, niacin, vitamin B-6 (pyridoxine), thiamin and pantothenic acid that are essential for the optimum cellular metabolic functions. It is also a rich source of minerals like copper, calcium, sodium, potassium, iron, manganese and phosphorus. Potassium is an important component of cell and body fluids that helps controlling heart rate and blood pressure by countering effects of sodium. The human body utilizes manganese as a co-factor for the antioxidant enzyme, superoxide dismutase. Iron is required for cellular oxidation and red blood cell formation. Swiss chard is available at its best during summer months from June until October. Chard can be harvested while its leaves are young and tender or after maturity when the leaves are larger and attained slightly tougher stems. 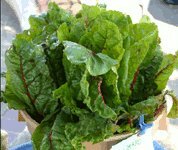 In the store, buy fresh chard leaves featuring crispy, crunchy, brilliant dark-green color. Chard is an extremely perishable leafy vegetable, and for the same reason, it should be used as early as possible once harvested. If at all to store inside the refrigerator, then, set its temperature below 35 degrees F and high humidity level to retain vitality for 1-2 days. Potato-soy pie with chard. Photo courtesy: George Kelly. As in spinach, chard leaves should be washed thoroughly in clean running water and rinsed in saline water for about 30 minutes in order to remove sand, dirt and any insecticide/fungicide residues. Fresh young chard leaves can be used raw in salads. Mature chard leaves and stalks are typically cooked, braised or sautéed; the bitter flavor fades with cooking. However, antioxidant properties of chard may significantly diminish on steaming, frying and boiling for long periods. Silverbeet pie, with pistachio, raisins, cheese stuffing (filling) is a favorite Italian and Mediterranean regions. Because of its high vitamin-K content, patients on anticoagulant therapy such as warfarin are encouraged to avoid it in the food since it increases vitamin-K concentration in the blood, which is what the drugs are often attempting to lower. It, thus, effectively raises the dose of the medicine and causes overdosage toxicity. Swiss chard contains oxalic acid, a naturally-occurring substance found in some vegetables, which may crystallize as oxalate stones in the urinary tract in some people. It is, therefore, advisable to avoid eating chard in individuals with known oxalate urinary tract stones. Adequate intake of water is therefore encouraged to maintain normal urine output. (Medical disclaimer). <<-Back to Vegetables from Swiss Chard nutrition. Visit here for an impressive list of vegetables with complete illustrations of their nutrition facts and health benefits.